Megadeth frontman Dave Mustaine has proffered his opinion on the current lead player Chris Broderick vs. long-standing ex-guitarist Marty Friedman debate in a new interview with TG's US-based sister mag Guitar World. "Chris and Marty both have their strengths and weaknesses," says Mustaine in the piece. "We've had great guitar players over the years with Megadeth, and that's been one constant with us. The guitar-playing ability has been consistently good to excellent. We've had some drummers who are average, and the bass playing has always been good. But Chris and Marty are on a level all their own." Alongside this rare blast of modesty the enigmatic guitarist also gives an update on the new Megedeth album, the follow-up to 2009's 'Endgame'. "It's gonna be heavy and not slow heavy like Black Sabbath or Trouble. It's very, very fast heavy." 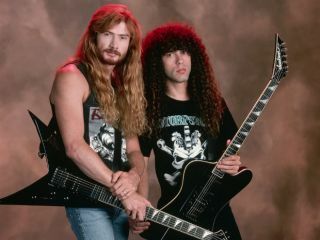 Mustaine also revealed that the album would pull together a variety of unrecorded material from throughout the band's career, "Some of the songs are old, some are new. Some were written this morning. Some back in the early stages of my career — songs that weren't previously recorded." Check out our Dave Mustaine interview to find out about the creation of 'Hangar 18', the standout track from Megadeth's 1990 album (and their first with Marty Friedman) 'Rust In Peace'.